1) Dikika, Lower Awash (Ethiopia). In 2000 the famous Lucy’s baby specimen was found there. She was a 3-year old Australopithecus afarensis dated to 3.3 Ma. Her oficial name is ‘Selam’ which means peace. New excavations on that site in 2010 reported cut, linear marks on animal bones dated to 3.4 Ma. BUT no actual tools were found, so there were various opinions against the human action by-purpose, instead the cut marks might have been the result of trampling by humans or other animals. So, the idea of 3.4 Ma tools was more or less set aside. NOW this idea is ‘strongly’ reconsidered. 2) Lomekwi (Kenya). In 1998 an interesting hominid specimen was found quite close (1 km away) to the site of the -now- famous tools. This was Kenyanthropus platyops, in theory different from Au. afarensis because of the smaller first molars, the flat lower face (however it is very distorted, so this may not be the actual morphology), and the small ear openings (similar to chimps and Au. anamensis). BUT no more relevant teeth were found (e.g. canines) nor post-cranial skeleton parts. NOW this hominid has regained much prominence because he could have been the author of the tools (same age, same location as the tools). Some argues that the stone tools may be more associated to Au. 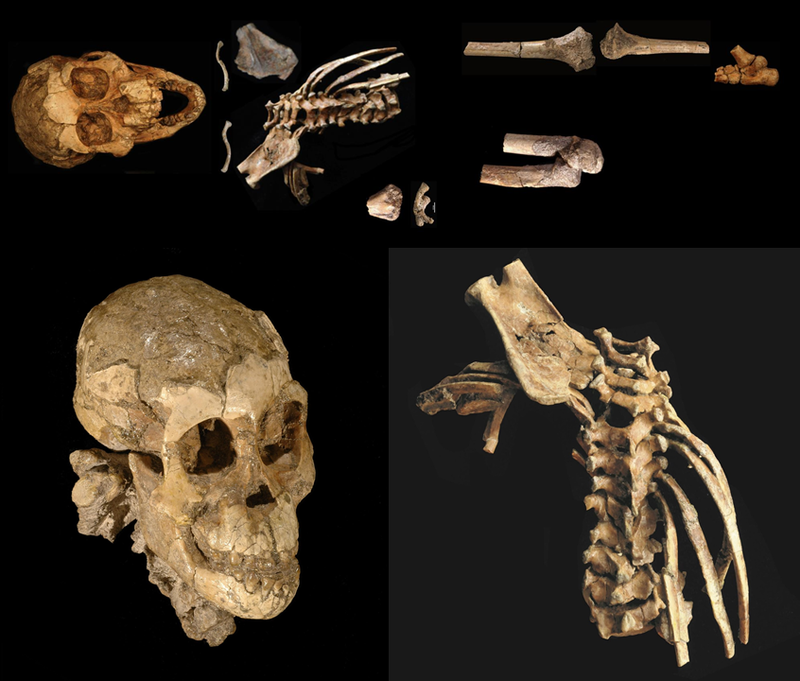 afarensis – but actually there is a parallel point to determine: if K. platyops could be just another population of australopitecines, given the enormous variation we really know about these. Lomekwi-3 site (I) and zoom to the excavation (R) – yes, what you see are some of the famous stones! They are larger and heavier than Olduwan. They are apparently made by hitting against a passive hammer (like chimps do today to crack nuts), rather than holding the core with the hand like in Oldowan technique. The flakes extracted show more errors or ‘accidents’ than in Oldowan technique. … Thefore, the development of ‘technology’ is not a milestone purely linked to the appearance of Homo. Probably the learning and social skills made early hominids to explore their technical abilities and to experiment with the resources around, like stones – for millions of years! Many experiments failed, but some of them succeeded and took part in the evolution processes -for some more hundreds of thousands of years- and so hominids learnt to produce stone flakes, cores, hammers and anvils. Were the ‘Lomekwian’ tools one of those experiments, which maybe succeeded locally? Did it become a consistent, spread technology? For the moment, I think that it seems OK to call it ‘Lomekwian’, al least for identifying precisely those key findings. By the way, this is another basic criteria to use the controversial name ‘Kenyanthropus platyops’ for the remains I described above – that is, at least for identifying precisely what this is and where this comes from.